Habit: Annual to shrub [tree, vine], glabrous to hairy, generally aromatic. Stem: generally erect, generally 4-angled. Leaf: generally simple to deeply lobed, generally opposite, generally gland-dotted. Inflorescence: generally cymes, generally many in dense axillary clusters surrounding stem, generally separated by evident internodes or collectively crowded, spike- or panicle-like, occasionally head-like or raceme, subtended by leaves or bracts; flowers sessile or pedicelled. Flower: generally bisexual; calyx generally 5-lobed, radial to bilateral; corolla generally bilateral, 1--2-lipped, upper lip entire or 2-lobed, +- flat to hood-like, occasionally 0, lower lip generally 3-lobed; stamens generally 4, epipetalous, generally exserted, paired, pairs generally unequal, occasionally 2, staminodes 2 or 0; ovary superior, generally 4-lobed to base chambers 2, ovules 2 per chamber, style 1, generally arising from center at junction of lobes, stigmas generally 2. Fruit: generally 4 nutlets, generally ovoid to oblong, smooth. Genera In Family: +- 230 genera, 7200 species: worldwide. Many cultivated for herbs, oils (Lavandula, lavender; Mentha, mint; Rosmarinus, rosemary; Thymus, thyme), some cultivated as ornamental (in California Cedronella, Leonotis, Monarda, Phlomis). Note: Moluccella laevis L., shell flower, historical waif in California. Satureja calamintha (L.) Scheele subsp. ascendens (Jordan) Briq. reported as alien but not naturalized. Salazaria moved to Scutellaria; California Hyptis moved to Condea, California Satureja moved to Clinopodium. Habit: [Perennial herb] shrub [tree], < 2 m, aromatic. Leaf: petioled, generally reduced to sessile bracts distally; blade generally 4--12 cm, lanceolate to ovate, rounded to cordate at base, crenate or serrate to entire. Inflorescence: raceme, open; bracts 1 per flower, leaf-like, lanceolate; pedicels persistent after fruit-fall. 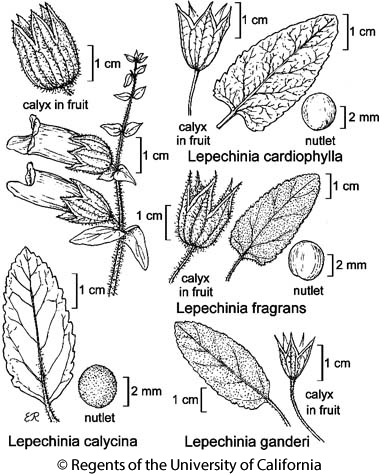 Flower: calyx 5-lobed, +- 2-lipped, scarlet-purple in age, enlarging in fruit, generally falling with fruit; corolla 5-lobed, 2-lipped, white to lavender tinged, lower lip longer, upper lip 4-lobed; stamens 4, in 2 pairs, included in throat, anther sacs spreading; style 2-lobed, included in throat. Fruit: 2--4 mm, round to oblong, black to dark brown, glabrous or minutely hairy. Chromosomes: 2n=32. Habit: Plant with long, branched, nonglandular hairs, occasionally with sessile to short-stalked glands. Leaf: lanceolate to narrowly ovate, +- entire to crenate-serrate. Flower: pedicel 0--1 cm; calyx inflated, spheric in fruit, generally persistent, lobes < tube. Fruit: hairs minute. Citation for this treatment: Deborah Engle Averett 2012, Lepechinia calycina, in Jepson Flora Project (eds.) Jepson eFlora, http://ucjeps.berkeley.edu/eflora/eflora_display.php?tid=30500, accessed on April 26, 2019. NCoR, CaRF, n&c SNF, CCo, SnFrB, SCoRO, WTR. Markers link to CCH specimen records. Yellow markers indicate records that may provide evidence for eFlora range revision or may have georeferencing or identification issues. Purple markers indicate specimens collected from a garden, greenhouse, or other non-wild location.